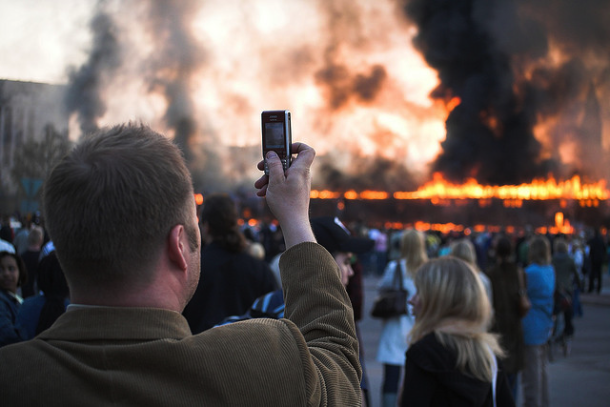 If there’s one thing that events such as the recent riots in Britain and protests in California have shown, it’s that mobile devices and social tools like Twitter and YouTube have effectively made everyone into a journalist, something we have argued in favor of at GigaOM. But not everyone likes this trend, and we’re not talking just about professional journalists — police forces across the U.S. have been arresting and prosecuting people for photographing or videotaping them, even in public places. And while the American Civil Liberties Union fights to have one such law struck down, a recent high-level court decision has championed the rights of bloggers and “citizen journalists” when it comes to freedom of the press. In one of the most recent incidents involving someone taking a video of the police in a public place, Emily Good of Rochester, N.Y. was arrested after she videotaped a local police incident from her own property — and was later charged with obstruction of justice for arguing with a police officer who told her she didn’t have the right to videotape him. As it turned out, the police officer was wrong: videotaping the police (or anyone else, for that matter) in a public place is perfectly legal in New York state. The chief of police later apologized and admitted that his force needed more training as to what is and isn’t illegal. As a recent article in Reason magazine noted, this is just one of the dozens — if not hundreds — of similar incidents that have occurred in a number of states. In some cases, police have used vague obstruction-of-justice charges to seize cameras and destroy photos and video, as the Bay Area Rapid Transit security forces did when passengers recorded the shooting of Oscar Grant in 2009. Police have tried to argue that taking photos or video is an invasion of privacy, but even in those states with laws that prevent taping someone without consent, the law only applies to conversations that are private. If you permit the audio recordings, they’ll be a lot more eavesdropping.… There’s going to be a lot of this snooping around by reporters and bloggers. Yes, it’s a bad thing. There is such a thing as privacy. Despite the judge’s comments, however, there have been a number of superior court decisions that have found the police do not have an expectation of privacy in the course of their normal public duties. Not only that, but legal scholars such as University of Tennessee law professor Glenn Reynolds (also a prominent blogger known as Instapundit) have pointed out that recording the police in some cases has a clear public benefit, as in the case of Tiawanda Moore, who used her BlackBerry to tape a meeting with Chicago police in which they pressured her to withdraw a sexual harassment claim against another officer. University of Pennsylvania law professor Seth Kreimer, who has written a research paper about the right of citizens to record public events under the First Amendment, told Reason magazine that rulings by three separate federal appeals courts have upheld that right. And one recent appeals court decision specifically referred to the fact that the ability to take photos, video and audio recordings with mobile devices has effectively made everyone a journalist — in practice, if not in name — and therefore deserving of protection. [C]hanges in technology and society have made the lines between private citizen and journalist exceedingly difficult to draw. The proliferation of electronic devices with video-recording capability means that many of our images of current events come from bystanders [and] and news stories are now just as likely to be broken by a blogger at her computer as a reporter at a major newspaper. Such developments make clear why the news-gathering protections of the First Amendment cannot turn on professional credentials or status. We couldn’t have put it any better ourselves (although we have tried a number of times). The advent of social news-distribution tools like Twitter and Facebook, not to mention blogs and YouTube and other web services and social networks, have powered what Om has called a “democratization of distribution” that makes virtually anyone into a publisher. The ramifications of that are still becoming clear — in some cases, governments are trying to shut down or restrict access to those tools, as Britain has talked about doing with Twitter and BlackBerry instant messenger in the wake of the riots there. The attempts by police to use poorly understood laws to prevent this kind of citizen journalism are just as reprehensible. They may not be as bad as the restrictions that totalitarian governments like China and Egypt and Libya have imposed on their citizens, but they are driven by the same motivation — to control information and squash dissent. That’s exactly the kind of thing the First Amendment was designed to prevent, and it’s nice to see courts like the First Circuit Court of Appeals recognize that. @amandabee See the judge’s quote at end of this piece. http://t.co/Vi61cw62 I feel like that is a good summation. in relation to freedom of the press, isn’t it illegal for the goverenment to do what they di yesterday in shutting down all media in america? What about a Cop who blogs? There’s all sorts of citizen reporters and advocacy journalists who do a better job in their field than someone who went to college and got a”journalism” degree. Nice article, Matthew. I would add an addendum that because freedom of the press applies to bloggers, it is critical for those bloggers to understand the responsibilities that come with this right. For example, when Vancouver residents sent their riot videos to police, they were turning over footage that traditional media would have required a subpoena to provide. This was capitalized on by police then turning citizen journalists into evidence gathering machines. No problems with that if you’re guilty, right? But as we all know, pictures don’t always tell the full story. To put it another way: It turns out that Big Brother wasn’t watching you after all, but all of your little cousins were. This could put more citizens in danger and subvert the freedoms that bloggers ultimately are striving to achieve. Alexandra Samuels has written extensively on this vigilante justice and it’s long-term implications. Given this newfound blogger freedom, I would argue that it is critical for digital literacy to be included as mandatory curriculum for students. I agree, David — just as there are rights that come with being a member of the media, there are responsibilities as well. Thanks for the comment. I agree that everyone is (potentially) a journalist these days, and that’s good. However, shield-law and source protection are big issues and still unresolved. In the meantime, here’s an idea that can help: Anyone committing “acts of journalism” should voluntarily take the TAO of Journalism pledge to be Transparent, Accountable and Open, and display the seal as a public promise. See http://taoofjournalism.org for details. 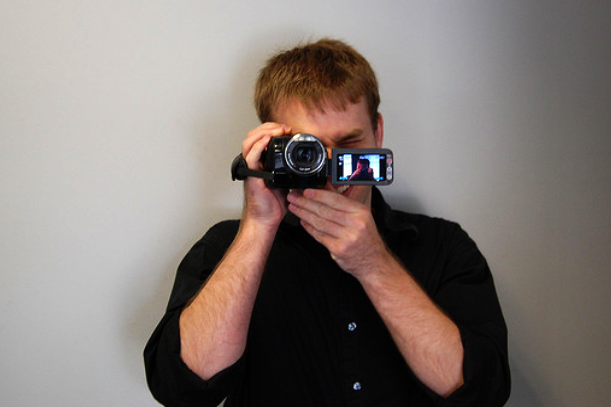 Journalists all around the world are signing up, especially younger and student journalists. See Directory page for a growing list. Just TAO it! Photographing of such events is not any crime. Even the third world countries allow this. i think there is a need of reviewing the law. I think we need to put it all no DVD’s! The court decision sounds like it would protect acts of journalism, as opposed to journalists. That’s an important shift. That said, if “freedom of the press” applies to everyone, does anyone have protection under shield laws? What about protection for the sources of journalists or whistleblowers?